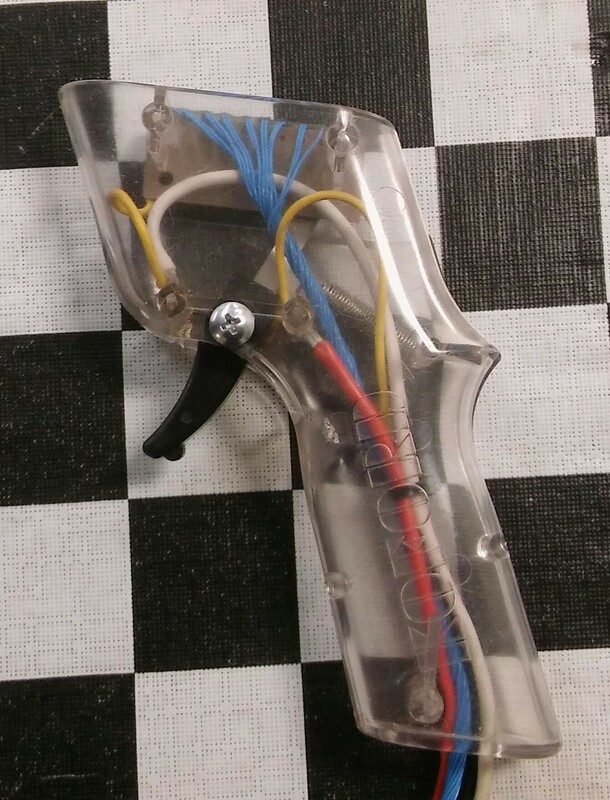 Speedy asked because more than ten years ago, our then local raceway stopped selling resistor controllers. What amazes me is that there were transistor controllers as far back as the late 60s. Why did it take so long for them to catch on? I remember the Cidex as being one of the first modern era E-trollers. By the time I got back into racing the Difalcos, Ruddocks and Third Eyes were the go to weapons. Is there a basic E-troller that rivals a Parma Turbo on cost? Something that would handle up to a S16-D on a commercial track. The early transistor controllers had 2 issues. They were not as good or equal to the performance of the best evolved remote resistors or diode controllers with switch blocks which were solutions at low cost to handle the high currents with reliability. And transistor controllers were not reliable. Once tne features were added for adjusting rate, sensitivity, and braking along with reliability, it was an easy choice. Controllers don't sell in the quantities as motors or chassis, so the evolution cycle is slower. A good remote resistor or diode controller was easily higher in performance than the best wound resistor ones. Early transistor controllers were not forgiving if they were hooked up wrong and lacked flexibility in that they had to be adapted to the current range of interest for different motor classes. It is an interesting evolution from wire wound resistors, to micro switches, to power on relays, brake resistors, switch blocks with diodes or remote resistors, to the variety transistor driven controllers available today. Not an E troller, but I have sold a bunch of the basic Koford resistor wire controllers to Newbies. I find them to be a really good little controller. Smooth operation and the wire doesn't get hot enough that it melts to your leg! actually I didn't remember that they stopped selling resistor controllers then. as an aside, when the DiFalco, Ruddock, etc. became popular, I couldn't find one that suited me so I started designing my own (ending up based on the parma handle and internals). as for my cost, once you buy the parma parts (or the whole controller) and then add all the electronic parts, heatsink, relay, etc., it ends up costing maybe twice as much. (aside from all the work! which is no doubt responsible for the pricing.) I've made a couple cheapos using fiberglass and in one case wood as a base, but the real handle feels better to me so I still buy that stuff. there are some good simple transistor circuits online, nowadays most of the electrical stuff has come down and one might be able to build something on the cheap. but I'm not aware of any made, other than this: have you looked at the lower end professor motors? Well I went to the track this week end with the Nephew and it did not smoke, the controller not the kid. He had a ball taking his mom out in the corners. sometimes with resistor-based controllers, the wiper doesn't return fully to the open or brake band and stays on the cold end of the hot windings while the brake contacts still meet. this results in a contradictory "brake on, track shorted while power-still-goes-to the-resistor" fault. that can lead to a little smoke as well. but I never have that happen myself! (at least not more than once every year or two.) fortunately it's a pretty easy mechanical fix, although you pretty much throw away that segment when it happens. sometimes really snapping the trigger back can be a temporary fix. or you can sometimes jam your pen in there. Bill, ever have that? maybe it's just me. but I do realize that this is likely not what you were talking about, which I think is running cars around and around on the low end of the stack. I asked my daughter once when she was pretty young, "you wanna just drive around, of do you want to race with me?" she chose race. so I taught her how to do it. over the years, she did really well. in her entire career she smoked one controller, and that was because the relay stuck on. my moral of my story: things can go wrong mechanically, but you should spend most of your time with the trigger fully pulled. My kids never wanted to go after I took them to a race and saw how crazy guys got, My nephew really likes it. I am happy that we got the controllers to work before Sunday. Thank you to everyones help. In the 13 years I've been in business, I've never sold a Parma controller. I'd always sold, and used for rentals, the Koford. When I was still working there, when we ran out of the gold anodized finned heatsink- resistor, I talked Stu into switching to the current setup, using the 1,000's of circuit board switch blocks, he had made up for the external resistor controllers. Switching to the loops of thin wire to create the resistance, vs. using a pricey long 100 watt resistor, made it doable, $$$ wise. While the heat handling capabilities are spectacular, for a $54-$55 controller,the handles have always been less than perfect. The black handles were almost strong enough for rentals, but not real comfortable. When he ran out of those, the new clear handles were comfortable, but a bit fragile. The latest are made from a new plastic, are almost right there. While it's not a much of an issue with adult use, I get so much real young kid use, when they deslot, they like to drop the controller and run to get their car. 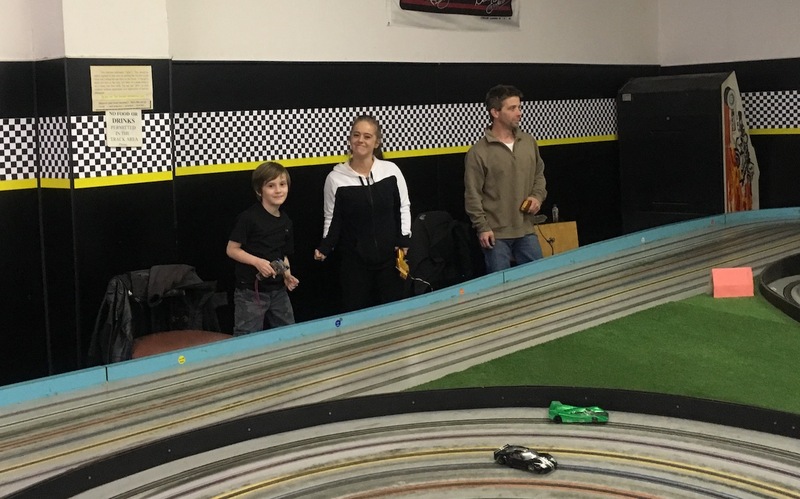 And with 4-6 year old birthday parties, with full on racing, the kids try to make the car go faster, by really squeezing hard on the trigger. With the above 2 scenarios, the molded in, trigger pivot pin occasional failed with the older material, plastic handle. Below is a pic where I just fixed one by installing an 8-32 steel screw, as the pivot pin. It has a real nice, more solid, feel. The other goofy "kid problem" I have, With the controller open at the top, 4-7 year old boys, are obsessed with picking at those thin blue wires. Mike, how many amps can the blue wires handle? Guys sometimes use them in our Group F wing races. I used a 3 ohm koford vari brake to race box stock a while back. The wires would get pretty hot but never to the point I couldn't use the controller.